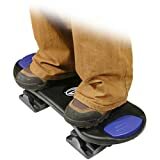 Isn't this just a Wii Fit in skateboard format? If a kid tries a kickflip on it, I think they'll break the peripheral. This is rubbish. The whole idea of me playing the tony hawks games is that i cant ACTUALLY ride a real skateboard. I want to be able to pull of indy flips and front side 540 faceplants with the use of my fingers, not by jumping all over my living room like some kind of demented chimpanzee. I had a few skater friends at school... some of the tricks they could do were really impressive. When one finally coaxed me onto a board, all that happened was I nearly broke my arm and my skull. I like skating games... but the reality is a bit more painful. Agree with the above... what a useless controller. "ha! i want to be able to rock on a real 6 strings and pull off l33t skillz on a Fender, not pushing 4 stupid buttons on a plastic guitar..."
Controlling your grinding balance might be fun, but some powerful force feedback would be needed on the board. You're all moaning about riding on the board.. I can't even crouch to do an ollie! I can see it now.... "the front room face-plant"
This WILL be the trick the kids will be "perfecting" until head meets dads new 42" HD telly. I just hope this rendition of the console skateboard controller isn't going to be as useless as the previous ones on the old Playstations!